Robert C. "Bob" Siegel Jr. Provide comfort for the family of Robert Siegel with a meaningful gesture of sympathy. 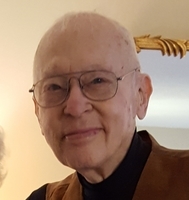 Robert C. Siegel, Jr., 93, of Mequon passed away peacefully on January 19, 2019. Bob was born on June 5, 1925 to Mildred and Robert C. Siegel of Milwaukee, WI. He graduated from Washington High School. He met Ruth (nee Welle) at UW-Madison and they were married for 69 years. His lovable personality, sharp wit and humor fueled his multi-decade success as a New York Life insurance salesman. He had many passions: Golf - he was on the UW-Madison golf team and continued playing through his later years at Ozaukee Country Club and in Palm Springs, CA; Dancing - he and Ruth co-founded the Mequon Dance Club and he loved to do his one-legged dance for anyone who would watch; Wooden Shoe Making - He was the only person in the U.S. who made Dutch wooden shoes by hand and performed this unique craft at many festivals across the nation; Gardening - he loved working in his Mequon home garden that was certified by the National Wildlife Foundation. Bob is survived by his wife, Ruth, daughters Anne Siegel and Meg (Bill) Feller, granddaughters Julia, Sarah and Katie Cherkinian, Madison and Allison Feller. Preceded in death by his parents, son Randall Siegel, sister Jeanne Blau and brother William Siegel. Celebration of Life memorial gathering will be at Ozaukee Congregational Church, 1142 Lakefield Rd., Grafton. Visitation 10am, service 11am on Saturday February 16, 2019. In lieu of flowers, donations can be sent to the Mequon Nature Preserve (mequonnaturepreserve.org). To send flowers in memory of Robert C. "Bob" Siegel Jr., please visit our Heartfelt Sympathies Store. Donations are being accepted for: MEQUON NATURE PRESERVE INC. Provide comfort for the family of Robert C. "Bob" Siegel Jr. by sending flowers. So very sorry to hear of Bob's passing. He was such an important tradition and beloved "fixture" at our Cedar Grove Holland Fest for so very many years. We appreciate the time we had with him and are grateful that he passed his skills on to a new generation. Prayers for peace and the comfort of many wonderful memories during this difficult time.